As Easter approaches we typically think about eggs. 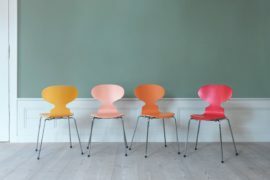 In what is a tenuous Easter link, this writer is thinking about a chair designed almost sixty years ago by the inimitable Arne Jacobsen. 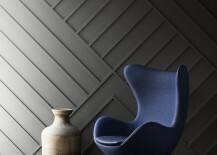 Egg™ in concrete grey leather. 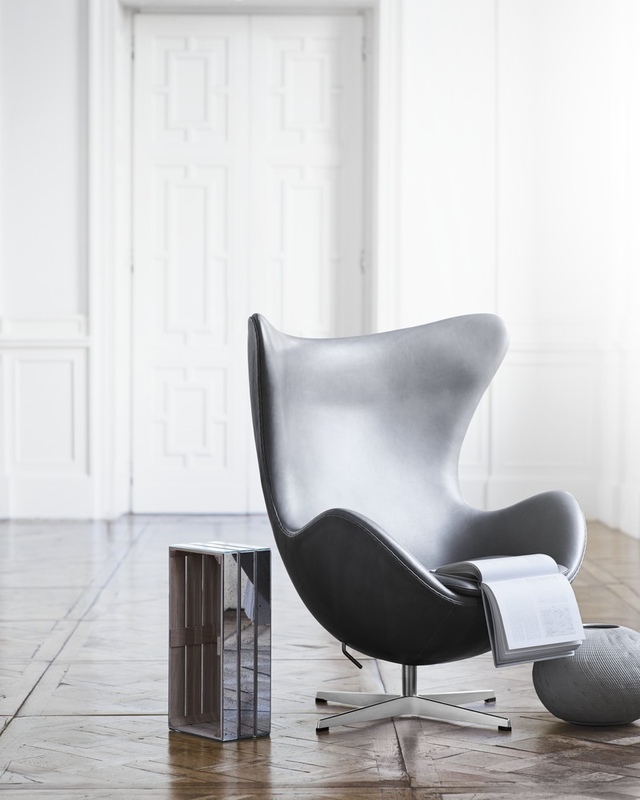 Arne Jacobsen’s Egg™ Chair is a sculptural opus, an icon of midcentury Danish modern design and an enduring classic. 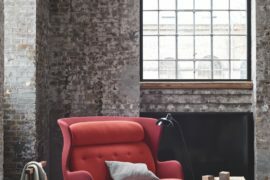 Coveted by design aficionados old and new, the Egg™ has never been out of production and remains a recognisable symbol of midcentury modernism. 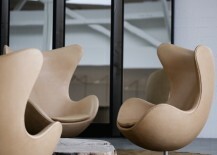 Jacobsen created the Egg™ chair in 1958 as a modern version of the timeless wing chair design. Comparisons have been made to Eero Saarinen’s earlier Womb Chair (1948), believed (by some) to have influenced Jacobsen’s design for the Egg™. 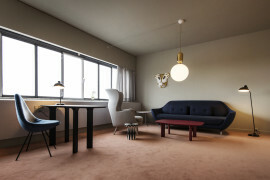 Commissioned to design every element of the former SAS Royal Hotel in Copenhagen (1958-1960) – from the high-rise facade to its interiors and furnishings – Jacobsen was able to successfully apply his theories on integrated architecture and design in practice. 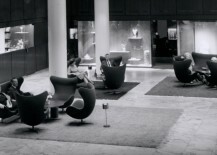 The Egg™ was a significant component of Jacobsen’s overall grand master plan for the Royal Hotel, and was designed to sit in the hotel’s reception and lobby areas. Historic image from the SAS Royal Hotel in Copenhagen. 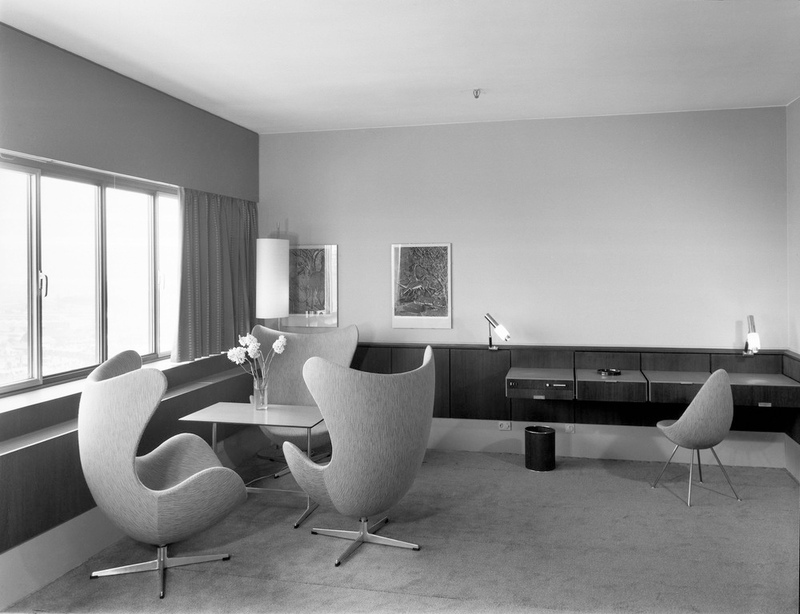 The Egg™ was first presented during the Formes Scandinaves Exhibition at the Musée des Arts Décoratifs in Paris in November 1958, as a part of Jacobsen’s proposed furnishings for the SAS Royal Hotel. (Source) Today, the SAS Royal Hotel is now the Radisson Blu Royal Hotel. 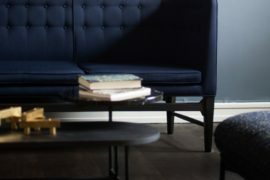 Once reminiscent of a Mad Men-esque midcentury Jet Age, Jacobsen’s modernist masterpiece has surrendered to the uniform decor found in many contemporary hotel chains. 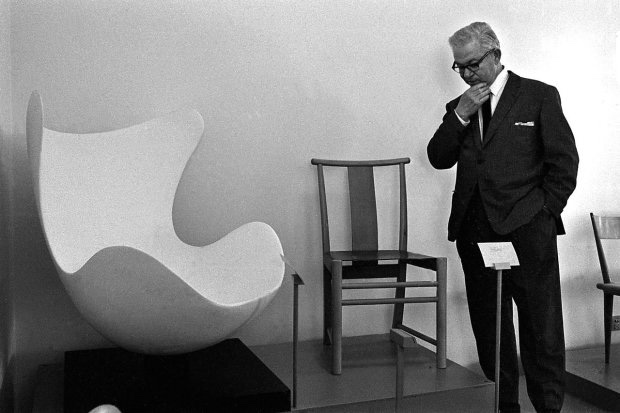 Thankfully, his Egg™ chair has remained a constant symbol of good design, preserved in perpetuity. Egg™ in SAS Royal Hotel Lobby. Image via Radisson Blu. 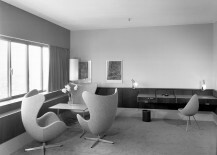 Arne Jacobsen at the SAS Royal Hotel. Image via Pamono courtesy of Radisson Blu Royal Hotel. A technological innovation, the Egg™ consisted only of curving contours. When placed in the Royal Hotel, a high-rise building constructed with vertical and horizontal lines, the Egg™ chair’s pure organic quality, along with its approachability, offered an altogether elegant contrast. It was indeed a veritable study in organic modernism. 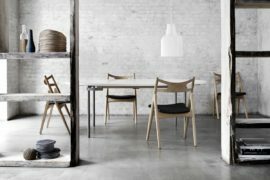 During that period, Jacobsen was one of the relatively few designers employing an organic style of furniture design, a humanistic approach that doubtless helped to increase his popularity. 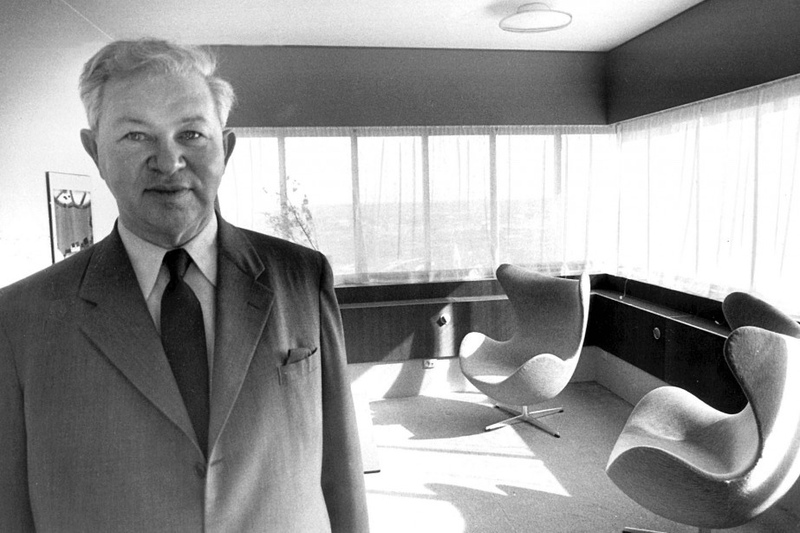 Arne Jacobsen and the Egg™ shell. Photo by Bjarne Lüthcke via Berlingske Media. Egg™ in three captivating shades of grey. 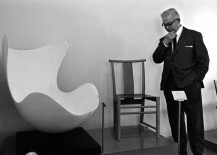 Jacobsen initially conceived the basis for the Egg™ chair in his garage, where he worked with clay to model and perfect its shape. In realising the chair, he was the first designer to make use of a strong foam inner shell underneath the upholstery. Today, the Egg™ is made using a polyurethane foam with glass fiber reinforcement. It is then padded with a cold foam and covered in fabric or leather – 1200 hand-sewn stitches go into the making of each Egg™. The chair’s shell has a tilt fitting that is adjustable to the user’s weight and stands on a star-shaped, satin-polished swivel base. 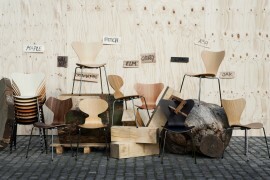 As a finished product, the Egg™ is a chair crafted with fervour and made for life. 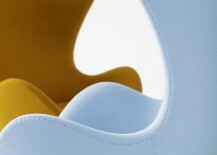 Egg™ chairs upholstered with the Divina fabric in the colours Divina 463 (yellow) and Divina 836 (turquoise). 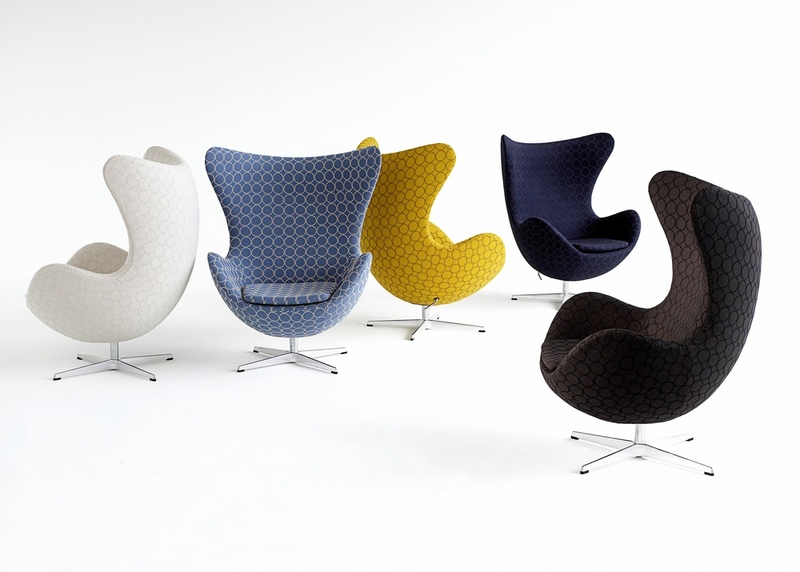 Egg™ chairs upholstered with fabric by Japanese designer Minagawa. Arne Jacobsen, an architect and designer, was also an artist, something that must have influenced his thinking on the use of colour. Many of Jacobsen’s furniture designs feature brilliant hues, and the Egg™ lends itself perfectly to coloured fabrics and leathers. Egg™ and footstool in Paul Smith fabric. 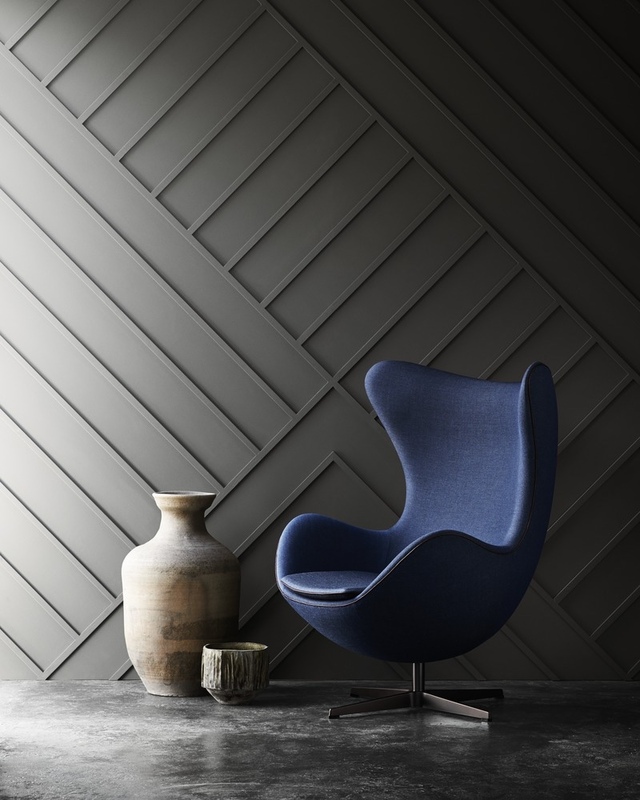 This special edition of the Egg™ is upholstered with dark blue Canvas fabric – inspired by Arne Jacobsen’s enthusiasm for bluish colour tones. The base has been made with a burnished look. 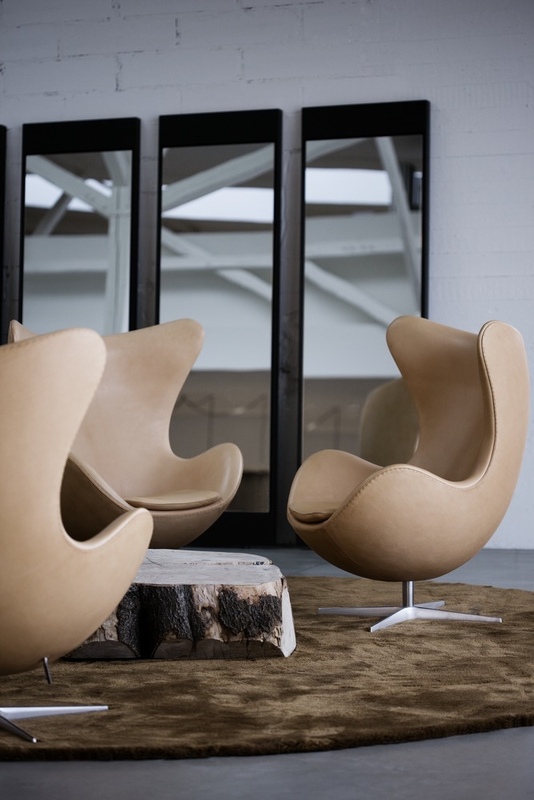 With its distinctive shape, the Egg™ strikes a commanding presence and pose, practically bidding the individual to sit. 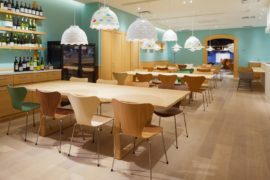 When seated, the chair provides a modicum of privacy, a feature that is particularly useful in public spaces or when wishing to nestle at home. With its swivel base, the sitter can choose to rotate towards the conversation or simply pivot away, finding their own seclusion. 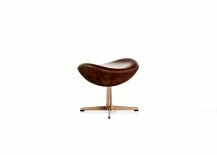 Egg™ and footstool in rustic leather. 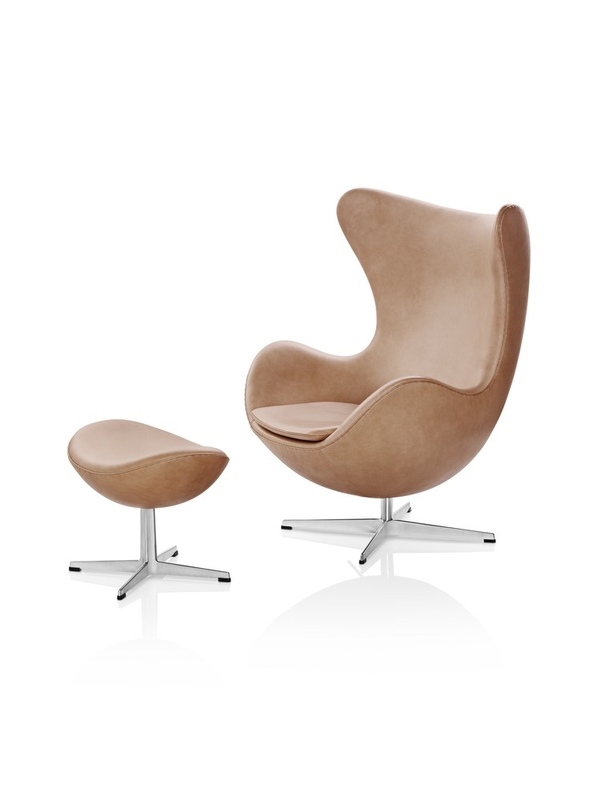 Accompanying the Egg™ chair, Jacobsen also designed the Egg™ foot stool in 1958. 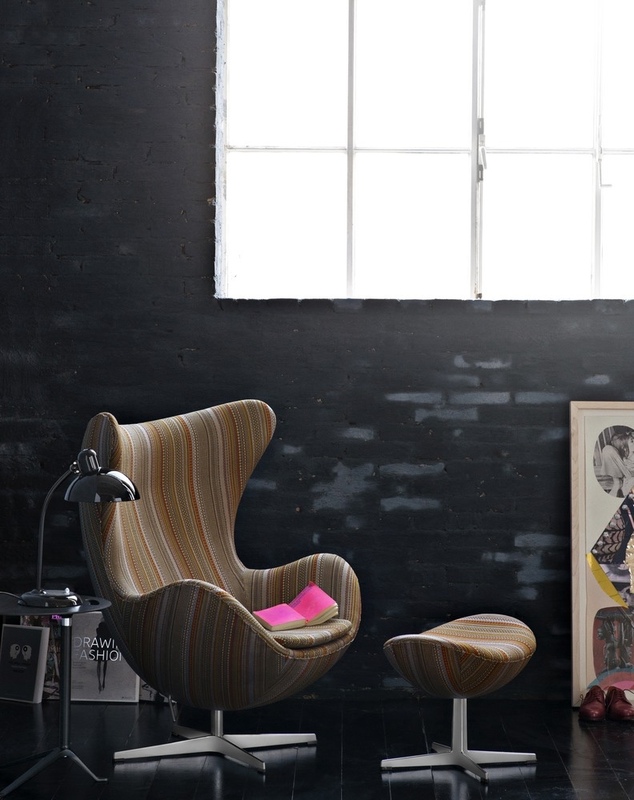 Both the chair and stool are manufactured by Fritz Hansen (the Egg™ was in fact Fritz Hansen’s first lounge chair). 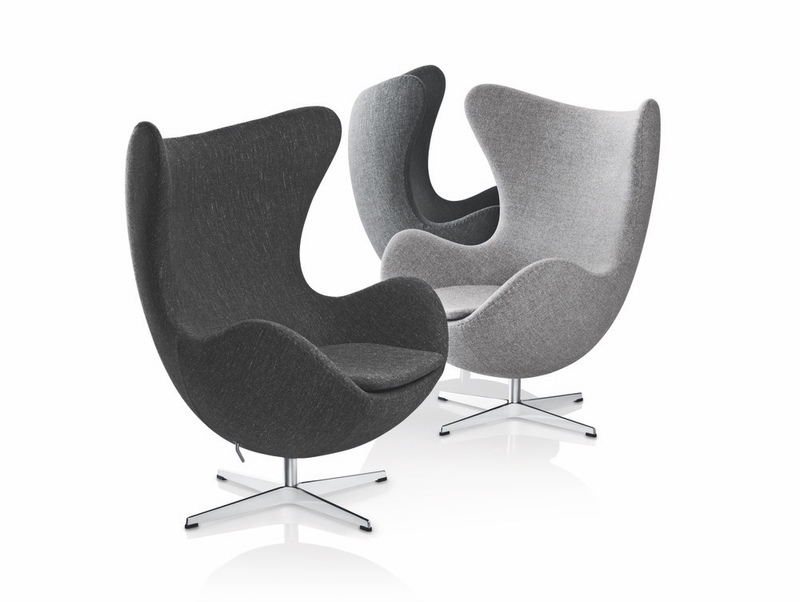 Almost sixty years later, the Egg™ remains a representative icon of Denmark’s much admired design DNA. All images © Republic of Fritz Hansen (except where noted otherwise).